The sequencer from the view menu will show current melody in piano-roll style. An imported midi-file will also be shown first using piano-roll display. Contrary to music notation, a detailed and timing-accurate display is possible. 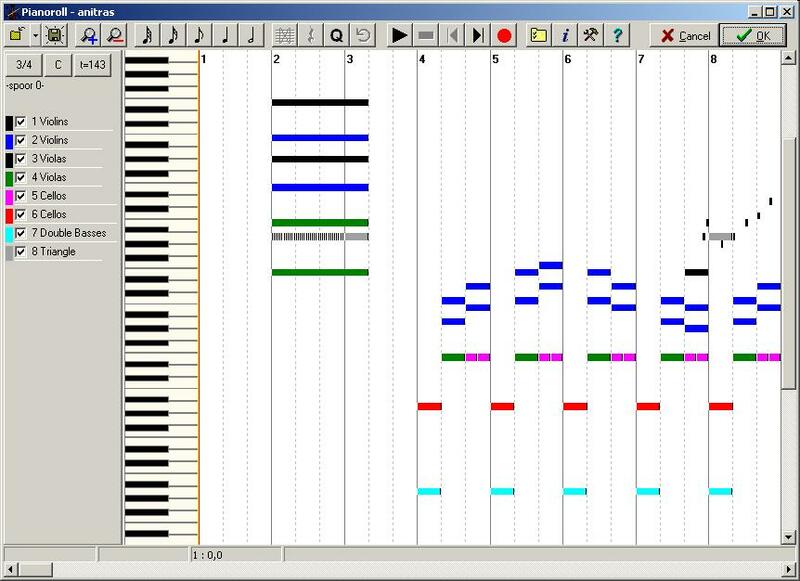 It is possible to edit a file in piano-roll display, as well as record a live midi-performance. If one of the duration-buttons is pressed, mouse-clicking will insert a note with corresponding length. You can delete a note by clicking on it while the <ctrl> key is pressed. To change meter, key or tempo, just press the corresponding button at the right upper corner. Delete duration within all parts. Duration needs to be selected previously using the duration buttons. Insert rest at cursor position. Duration needs to be selected previously using the duration buttons. When you are done editing just press the OK button and the midi-tune will be converted into a musicad-file and displayed on the main screen.